Camp Knife - Introduction to Bladesmithing with Jorden LaMothe. #1264-0915. 3 days. 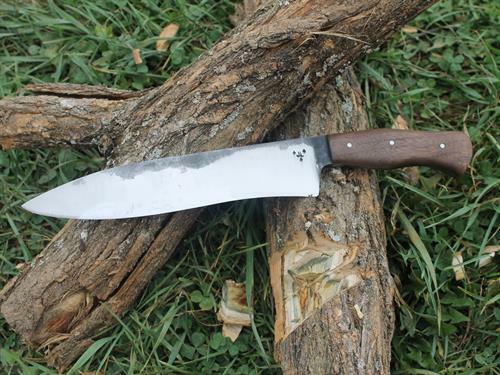 Name: Camp Knife - Introduction to Bladesmithing with Jorden LaMothe. #1264-0915. 3 days. A heavy chopping knife is an invaluable tool for clearing brush and splitting kindling. This class is a comprehensive introduction to bladesmithing. Each student will forge a blade using a gas forge and hand hammer, grind, heat treat and finish the blade with a wood handle. Emphasis will be placed on ergonomic design, edge geometry and heat treating to maximize performance of a working knife. NOTE: Students are required to wear non-synthetic clothing, long pants and closed-toe shoes. Tuition $365. Member Tuition $315. Materials fee $75.